Simple enough to pair with any outfit but eye-catching enough to make a statement; that’s the Born Regis. This women’s bootie has an upper made of either full grain or distressed suede with an adjustable strap around the ankle and the vamp. The side zipper helps you easily slip into the comfort of a microfiber lining a generously cushioned footbed. Born’s Opanka construction ensures that these booties are lightweight and flexible while still being durable and the steel shank provides lateral stability. The Regis is finished off with a 1” stacked heel and a rubber outsole for traction. 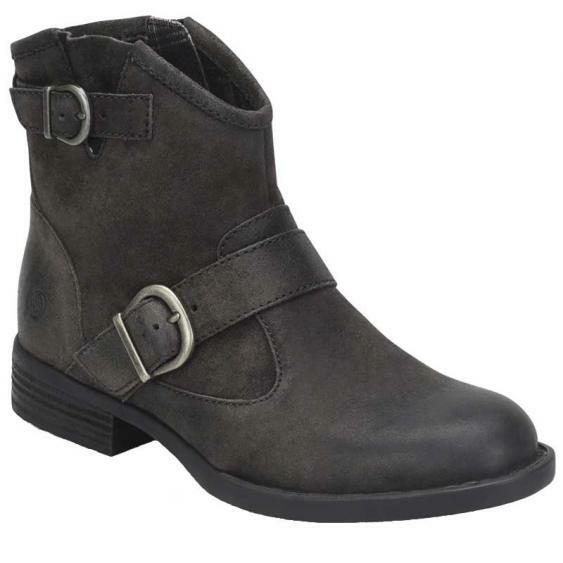 You’ll get more than enough use out this classy take on the ankle boot from Born.